Home > Discography > What's the Dark Matter? Single song released through digital download. Currently available through ReverbNation. Released on1/15/14. 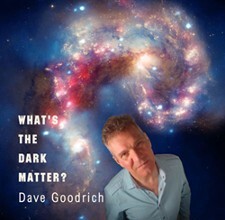 Merging the secrets of the universe with the concept of relationships, Dave Goodrich co-wrote this song with bassist Sam Churchill, who played the bass on this recording. Besides providing the lead vocals as well as all guitar, keyboard, and drum tracks, Dave Goodrich produced, engineered, and mastered this cosmic questioning tune. Cheryl Morey provided rich backing vocals. TRACKS: What's the Dark Matter?